While you are relaxing with your villa with swimming pool near Sibenik, Croatia and enjoying a hot summer day with a cup of coffee and a favorite book, adventure and adrenaline is waiting for you between two historical cities: City of Šibenik and City of Drniš - zip line! Going down a 1.4 kilometer long zip line reaching speeds up to 70 km/h and heights up to 200 meters. Does that sound exciting? Čikola river is a magnificent river that is 46 kilometer long and takes visitors' breaths away with its beauty. Čikola canyon, an magnificent tourist attraction, is rich with 298 different flora, medieval fortress and caves. 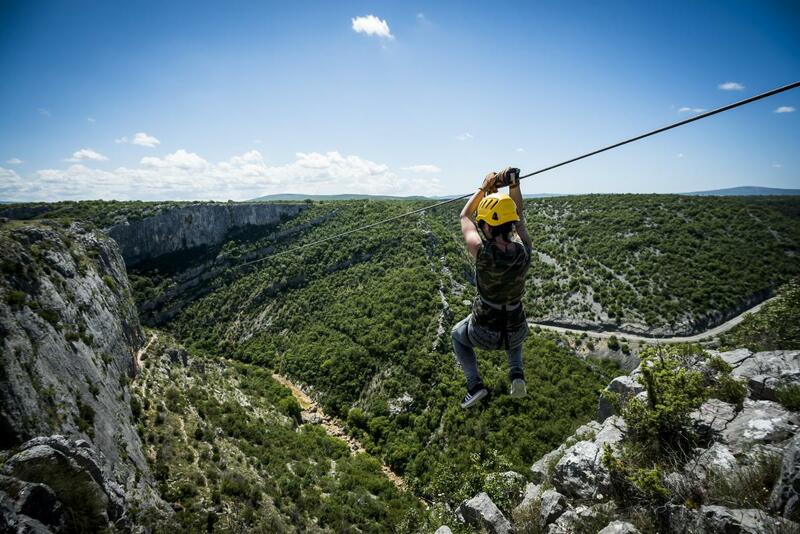 Čikola zipline is an attraction which has 3 long lines that connect opposing sides of the Čikola canyon and those who want to try this adrenaline rush are secured with belts. Starting platform is at 234 meters height and it takes 40 seconds to get on the second platform while enjoying the stunning nature. Third platform is located at 141 meters and from there, the highest speed is reached. The view is fantastic! Woods, untouched nature and stone landscape is nice on the eyes! If you are afraid of heights, don't worry as the safety is on the highest level with professional instructors at your disposal. To overcome your fear, there is a testing line which can be used to try out hanging on the ropes. It is surely worth it to overcome your fear because the experience of flying over the Čikola Canyon is priceless. Regardless is your villa near Sibenik or villa near National park Krka, this is an attraction you should not miss! Check out our villas in Croatia offer here.